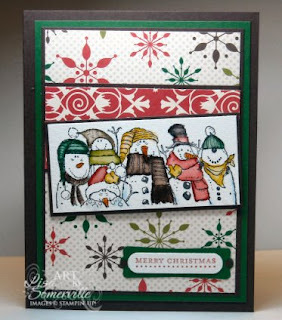 The beautiful Christmas DSP is the new Merry Moments from Stampin' Up! in the Idea Book & Catalog. The focal image is Holiday Line Up, I was so happy to see this one return this year, it's one of my favorites for Christmas cards. 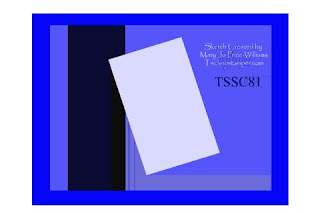 The image was stamped in Black and colored using the Marker Watercoloring Technique, using color that coordinate with the DSP. The Sentiment from Teeny Tiny Wishes is stamped in Red, punched with the Word Window Punch, and layered on piece of Garden Green that was punched with the Modern Label Punch. I added Faux Brads in Chocolate using the Double Circle Punch. If you need to order any of these items, just click here, then click shop now. Lisa! Yours turned out wonderfully; especially with the way you used the DSP! The watercoloring is phenominal! (did I spell that right?) Hugs! Fabulous, love how you used the different dp's. Great idea! What a great idea. Boy are you guys smart. Love this. The colors are great! So fun. Thanks for playing along Lisa. Very cute, love the designer paper, great coloring job. I'll need to make one for myself. I love this image! Fun stuff!